Research shows that the most effective time to deal with an invasive species, both in terms of controlling or eradicating the species and money spent to do so, is early on…. What we call Early Detection Rapid Response. Beach vitex is a good candidate for this. The first record for vitex in the Florida panhandle was in 2012. A local citizen in Gulf Breeze (Santa Rosa County) reported it on her beach and believed it may have come from Santa Rosa Island… it did. The barrier island location was logged on EDDmaps and the Gulf Breeze plants were removed. A quick survey of Florida on EDDmaps found that the only other location was in Duval County – 3 records there. So this was not a wide spread plant in our state and could be a rare case for eradication. That was until I surveyed Pensacola Beach on a bicycle and found 22 properties with it. Soon afterwards, it was found on the shores of Perdido Bay and concern set it that it might be more widespread than we thought. We tried to educate the property owners about the issue based on what we learned in South Carolina, where there is a state task force to battle the plant, and suggested methods of removal. Many property owners began the process, which can take several treatments over several years, and, with the help of University of West Florida students, removed all of the vitex from public land on Santa Rosa Island. 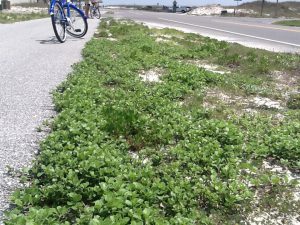 We were feeling good that we might still be able to eradicate this plant from our county… and then I went for a hike in the Gulf Islands National Seashore… yep… found more… almost 10,000 m2 of the plant. 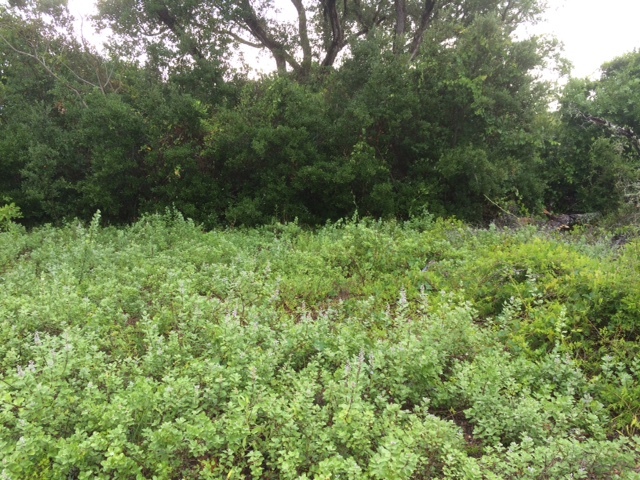 UWF and Sea Grant have worked hard over the past year to remove these plants, and have removed all but one section. Recently I received an email letting me know that it was found in Franklin County. They have since logged this on EDDmaps and have begun the removal process. However, this begs the question… where else might this plant be in the panhandle? Beach vitex (Vitex rotundifolia) is a salt tolerant plant that does well in dry sandy soils and full sun; it loves the beach. We have found it in dune areas above the high tide line. It was brought to the United States in the 1950’s for herbarium use. By the 1980,’s the plant was used in landscaping and sold at nurseries. It was first used in dune restoration in South Carolina after Hurricane Hugo, and that was when the trouble began. The plant grows very aggressively during the warmer months. It out competes native dune plants and quickly takes over. Growing 2-3 foot tall, this woody shrub has above ground rhizomes that can extend over 20 feet. Secondary roots begin to grow from the nodes along these rhizomes and it quickly forms an entangled mat of vines that blocks sun for some of the native plants. There has also been concern for nesting sea turtles. The rhizomes can over take a nest while incubation is occurring and entrapping the hatchlings. The plant has become such a problem in both North and South Carolina that a state task force has been developed to battle it. Vitex can spread either vegetative or by seed, both can tolerate being in salt water and can be dispersed via tides and currents. 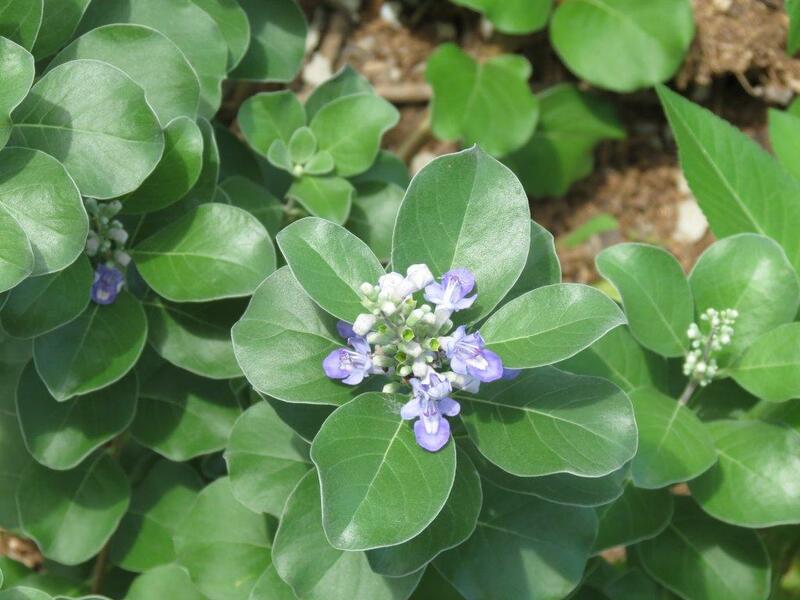 The plant has 1-2” ovate leaves and violet colored blossom, which can be seen in late spring and summer. The leaves become a rusty gray color during winter. The seeds, which are found in late summer and fall, are spherical and gray-purple in color. Vitex produces many seeds, an estimated 22,000/m2, and – in addition to being carried by the tide – can be transported by birds as well. Again, we are hoping that the plant has been discovered early enough to control, if not eradicate, it… HOWEVER, WE NEED YOUR HELP. If you think you may have seen this plant along your coasts, please contact your county Sea Grant Extension Agent for advice on how to manage it.